The Netherlands Delta Cycling X rider was quickest out of the select 26 man group which sprinted for victory, beating Italian Matteo Cigala (Westmeath Viner-Caremark – Pactimo), Robbe Ghys (Belgian National Team), Jacob Rathe (USA Jelly Belly P/B Maxxis), Luuc Bugter (Netherlands Delta Cycling X) and others to the line. 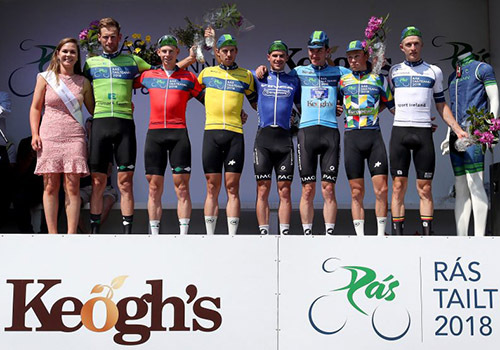 Ronan McLaughlin (Westmeath Viner-Caremark – Pactimo) was best of the Irish riders in eighth, taking over as best county rider. He was joined several kilometres later by Irish riders Simon Ryan (Cork STRATA 3 – VeloRevolution Cycling Team), Conor Kissane (Kerry Killarney) and Seán Hahessy (Westmeath Viner-Caremark – Pactimo), who would stay clear over the category two climbs of Ladies View (km 82.4), Molls Gap (km 87.3) and Garranes (km 117.1), where Kissane won each of the primes and moved to within one point of the total of the King of the Mountains Lukas Ruegg (Switzerland National Team). jersey. He remains ten seconds clear of Luuc Bugter (Netherlands Delta Cycling X), 11 ahead of Damien Shaw (Ireland Holdsworth Pro Racing Team) and 13 up on Robbe Ghys (Belgian National Team). 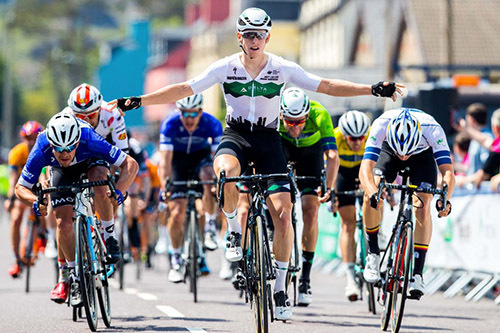 After approximately 17 kilometres Darnell Moore (Ireland National Team) and Martin Frazer (Britain Saint Piran Elite Cycling Team) went clear. They built an eight-second gap, but were soon brought back. Next to try were Adriaan Janssen (Netherlands Delta Cycling X) and James Tillett (Wales Racing Academy – National Team), who were then joined by Claudio Imhof (Switzerland National Team) at the start of the category three climb of Crinny. King of the Mountains leader Lukas Ruegg (Switzerland National Team) took top points at the top, with Daniel Coombe (Wales Racing Academy – National Team) second and Taylor Shelden (USA Jelly Belly P/B Maxxis) third. Several kilometres later a group of five moved clear, namely Marc Potts (Ireland National Team), Sean McKenna (Ireland Holdsworth Pro Racing Team), Lukas Ruegg (Switzerland National Team), Ulises Alfredo Castillo Soto (USA Jelly Belly p/b Maxxis) and Matteo Cigala (Westmeath Viner-Caremark – Pactimo). King of the Mountains leader Ruegg was next, adding more points to his tally, while William Roberts (Wales Racing Academy – National Team) was third. The break comprised Marc Potts (Ireland National Team), Moreno De Pauw (Belgian National Team), Jake Alderman (Britain Saint Piran Elite Cycling Team), Martin Frazer (Britain Saint Piran Elite Cycling Team), Adne van Engelen (Germany Bike Aid), Jason van Dalen (Netherlands Delta Cycling X), Thery Schir (Switzerland National Team), Ulises Alfredo Castillo Soto (USA Jelly Belly p/b Maxxis), Taylor Shelden (USA Jelly Belly P/B Maxxis), Daniel Coombe (Wales Racing Academy – National Team), Conor Kissane (Kerry Killarney) and Conor McCann (Tipperary Collins Cycle Centre). Sensing opportunity, three chasers jumped across – Simon Ryan (Cork STRATA 3 – VeloRevolution Cycling Team), Conor Kissane (Kerry Killarney) and Seán Hahessy (Westmeath Viner-Caremark – Pactimo). They joined Castillo Soto shortly before the start of the Ladies View climb and, once onto the mountain itself, the peloton was at one minute and 55 seconds. The gap soon increased to over two minutes.